Mr. Słabczyński gives positive proofs on the grounds of his research into the history of the Polish uprising of 1831, that Strzelecki hand a certain function in it by serving as courier for the transmission of the most secret and important correspondence from Poland to France. 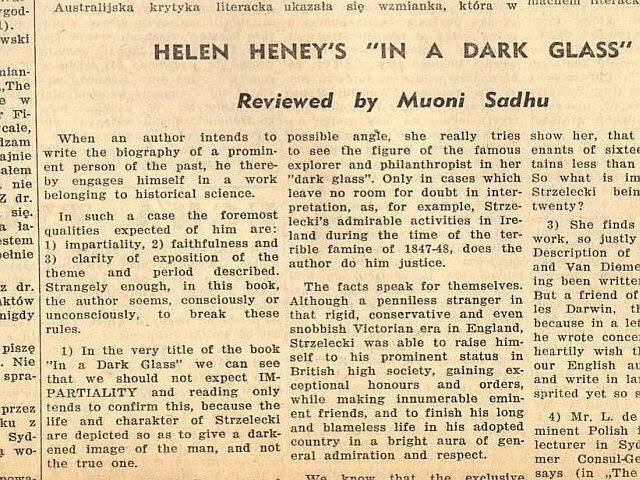 Miss Heney flatly dismissed any participation of Strzelecki in his country's fight for freedom. Peter, Strzelecki's older brother (born in 1794) was adjutant to Marshall Murrat in the Napoleonic Army. His portrait in full captain's uniform is in the Poznań National Museum. But Mis Heney does not like this, and dismissed it simply by saying that Peter „Peter Strzelecki was too young...”. Now ever, a keener insight into the Napoleonic period (and later ones as well) would show her, that there were lieutenants of sixteen years and captains less than twenty years old. So what is impossible a captain at twenty? Here he is speaking about the first biographer of Strzelecki - Mrs. Żmichowska, from whom Miss Heney indiscriminately took all her gossip and tales. Wilfully calling Strzelecki a „bad Pole”, Miss Heney in her book evidently forgets, that this man, in her opinion „deprived of patriotism”, gave to his most important discoveries the name of the foremost Polish national hero - Kościuszko. In his letters, quoted in the Słabczyński book „Selected Writings of Paul Edmund Strzelecki” we find a man of great hear, moral steadiness and genuine love of his unhappy country, and no dark glasses can ever overshadow his figure, at least, for those who would take the trouble to investigate documentary and unbiased sources, mhich alone can serve as a basis for any historical work. The original Polish names and their spelling by Miss Heney are often wrong, and one can only wonder why a person, well acquainted with the language, as she says, committed such errors. This cannot be justified by printing difficulties, because, for example, my own books some times contain quotations and names in several foreign languages, including the ancient Hebrew alphabet and yet my Publishers invariably retain faultless spelling and grammar. Final, the frontispiece presents a distorted (probably due to poor reproduction) portrait of the explorer. See _excerpt_ from the article of Polish Weekley.